There are many popular festivals in Morocco which you can discover during your trip. This Arab country in North Africa has a very varied calendar of events. In general, the Muslim calendar, or lunar calendar, is the one which marks the main festivals of the country. To understand the popular festivals in Morocco, it is important to know the Muslim calendar. 98% of the population follows the traditions of this calendar, where the most important months are: the month of January or Moharrem, which marks the New Year, March or Rabi, which marks the birth of the prophet, the month of September or month of Ramadan, and the month of October, called the month of Du al-Haya, when the festival of the lamb is celebrated. One of the most popular festivals in Morocco is the New Year and the festival of Ashura, on 10th January. The latter is similar to the festival in the Christian calendar when we give toys to the little ones. In February there is the Moussem festival of Sidi Ben Aïssa, one of the events in Morocco which bring together the followers of the Brotherhood of the Aissaoua. During this celebration which lasts several days, the pilgrims settle in Meknes, in tents. Music events and mystic dances are celebrated, along with religious processions and shows with horses. March is the month of one of the most beautiful Moroccan festivities: the Tafraoute, the festival of the almond tree in bloom. In the south of the Atlas, the almond blossoms of Valle Ameln welcome all those who want to celebrate this event. You can attend concerts, dances and outdoor shows, and traditional markets. If you are in Morocco in April, keep some time free to attend the Jardin'art festival in Marrakech. Numerous events related to botany, such as ephemeral gardens, workshops, and floral displays take over the city. There is also music, craft stalls and all kinds of traditional shows. May is the month with more events in Morocco, we start with the Gnawa Festival of world music. This festival which takes place in Essaouira is a meeting of world music of great prestige and a must-visit. Also in May, another of the popular festivals of Morocco which you cannot miss is the Kelaa M'Gouna or Festival of the Rose. The oasis located in the valley of the M'Goun River hosts a festival in honor of the rose of Damascus. 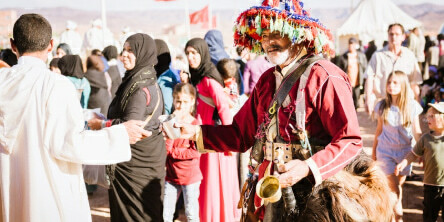 The festival lasts 3 days, where there are concerts of Berber music, traditional dances, and songs and the famous rain of rose petals. During the month of June, another of Morocco's most popular festivals is the Sefrou Cherry Festival. This festival has been declared an Intangible Heritage of Humanity, so don't miss it. There are parades of floats, dances and the expected beauty contest to choose the Queen of the Cherries. In July the Moroccans celebrate the National Festival of Popular Arts of Marrakech. This festival has also been declared a Heritage of Humanity for its spectacular display of color, music and traditional dances. In Assilah, you can participate in the International Cultural Festival which bears the same name. There are concerts, workshops, theatre performances, shows with horses and the most picturesque: the white walls of the city are painted in different colors. Among the popular religious festivals, in August the Moussem Festival of Moulay Abdellah is celebrated. At the end of the month, in the Ourika Valley, there is also the Setti Fatma Festival, and to the north of Meknes, the Moulay Driss Zerhoun. In these festivities of Morocco, religious content is celebrated with great fervor and respect, as it commemorates sacred events in honor of important figures of the Sunni Muslim religion. In September, in the heart of the Atlas, the locals celebrate the Festival of the Brides or Moussem of Imilchil. During this particular festival, some thirty young people from the region are freely chosen and get married. The curious thing about this wedding is that the couple can return to their families if they have not been satisfied with the choice and remarry someone different the following year. In October and among the popular festivities of Morocco, we can attend the Date Festival. This celebration takes place in Erfoud every 17 October and coincides with the harvest of this fruit. There are dances and traditional music, and of course stalls with small sweets made from dates. On the other hand, we must remember that, according to the lunar calendar, October is the month of Ramadan. During this month, Moroccans fulfill the tradition of fasting from sunrise to sunset. During the months of November and December, at the end of the Ramadan fast, the Eid Al-Adha or Festival of the Lamb is celebrated. This festival commemorates the Sacrifice of Abraham, during which a lamb is sacrificed, to be consumed by families among great delicacies. As you have seen, there are many popular festivals in Morocco which you can match up with your trip. Nothing like mixing with the people of a country to live their culture and traditions more closely.